We have for sale a complete assortment of the grooming tools and shampoos that we use in the salon. The brushes and thinning tools used in our Brushout video are available….view the video for a demonstration of their use. A description of the shampoos that we use can be found in a separate article found in this section ( Our Shampoo Selection ). In addition we carry our cologne, some dental care products and a basic assortment of collars and leashes. 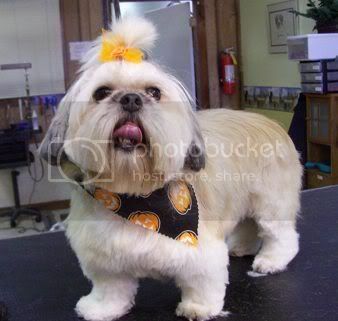 As of 08/21/14 I need to make a minimum of $45.00 an hour per groomer to operate the business. The profit after labor, rent, utilities, etc is not enough for me to be employed solely as an owner—I have to groom as well. Not as much as when the kids were at home, but I can’t sit and just supervise—yet. Our groomers can do 5-6 dogs a piece per day by themselves and that’s it. They can’t do more and maintain quality. I can increase that production by hiring a bather-dryer and I do. When she is employed, the groomers can do between 6 and 7 dogs (but then I have an extra salary to meet). So, the first consideration in determining the cost of a haircut is the per hour fee. The second consideration is the skill required—full coated dogs that are scissored by hand require much more skill than a clipper cut. 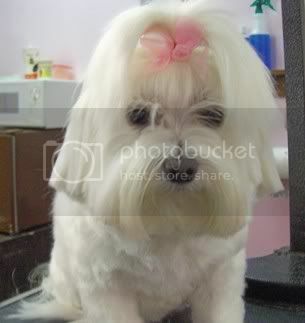 Take a Bichon Frise for example. A scissor cut between 1.5 and 2 inches costs $68 and that’s if there are no tangles. A clipper cut to ½ an inch is $58 and takes almost a half hour less time. If you bring in a Collie and it takes 2 hours to brush, bathe, and dry him, expect a charge of $90. Add trimming of the feet, tail, and feathers—it’ll be closer to $100. A third consideration is the density of the coat (whether it is matted or packed with undercoat). Dogs that come in once a year to be clipped short for the summer cost more than those dogs who get the same clip but come in every 6-8 weeks. For example, a 6-8 week short cut on a cocker is $58. It will be more like $62 if the Cocker has a full coat. Another very important cost factor is pet behavior. Puppies and seniors generally require more time and patience, thus cost more. Some customers expect that since their puppy is smaller that it will cost less, but it usually takes as much time or more to get them acclimated to the grooming process. So, there you have it—time, skill, condition and behavior are factors considered in price. Clients can get the best value for their buck by keeping the coat in a matt-free condition to reduce the labor charge. Our posted price is based on a good condition—if we have to brush your dog an extra 15 minutes, expect a corresponding increase in your bill. This is one of the best bargains going when I consider costs per hour of other service industries—called a plumber lately? 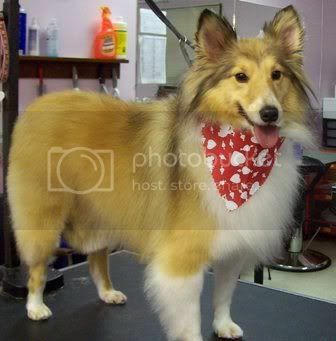 The final step in the grooming process for most of our pets is the tying on of the bandana….the dogs go nuts! Tails wag and they start running in place from the excitement of being finished; they made it! Dogs perform much better to a regular routine that takes care of their basic needs, and so do we. Whether we consciously know it or not, most of us follow a schedule with our pets everyday. Here’s Lizzie’s, Up at 6:00am to go for that morning bathroom break followed by a 3 mile walk- of which 1/2 mile is off lead. At 7:00 she get’s fed- same diet and same amount. 7:15 off to work where she performs her receptionist duties for the day. At 12:00 we go for a short walk behind the shop where she can stretch her legs and go to the bathroom again. After work we go for another short walk and yes, another bathroom break. Then its time for sitting on the deck till dinner- I have a vodka tonic and she gets to watch! After dinner, one more trip outside. This is her routine everyday. On the weekends at the houseboat the timing is much the same- just different setting. Your pet learns the sequence for grooming after a few visits and most of them know exactly what to expect. 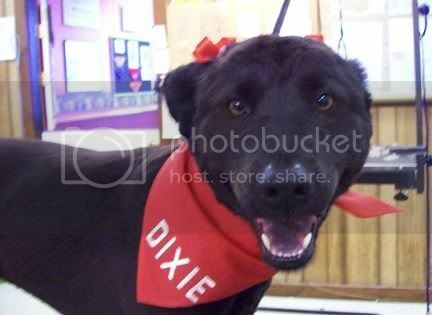 Initial brush out, nails, hair cut, bathe,dry and final clipping- followed by that bandana. Some dogs are so familiar with what goes on and when,that they don’t need a leash to go from station to station. Mica Schmeltzer, one of our standard poodles, goes on his own from the front door to the holding area, picks out a run and goes in. When its his turn for grooming he goes from station to station on his own- jumping up on the table or in the tub with very little assistance. Shay Collier, Shayna Petro and Willis Warnecke to name a few,do like wise. When our pets know what to expect they are happier- and if they are accustom to a certain activity at a given time and you don’t allow it, they are liable to let you know. Dorothy Thomas has been a great customer of ours for years. Last spring, her children got together and gave her a unique and much appreciated gift certificate that she could share with her Toy Poodle, Rene. They pooled their money and bought her a certificate for $200–the equivalent of four haircuts. If you have a special someone with a dog and can’t quite figure out what to get them, keep us in mind. You don’t even need to come in, simply give us a call and we can have the gift certificate mailed to you or your recipient. We offer a nail grinding or “buffing” service for an additional cost. This method sands the nail to shape and allows us to smooth out the edges so they aren’t as sharp as nails that are clipped. This service is recommended if your dog is allowed to sit in your lap and her nails may come in contact with your arms–especially encouraged for our senior citizens with sensitive skin. If you allow your dog jump on you, buffing the front nails is encouraged. We can even monogram your pet’s name! PROTEIN, ALOE, LANOLIN: This is our default shampoo that contains the richest conditioning ingredients available for producing abundantly beautiful coats. Strengthening Protein builds body and revives damaged hair.Lanolin moisturizes, leaving a natural shine, while Aloe soothes itchy or irritated skin. Contains a fresh herbal fragrance. MELALEUCA: Helps combat seborrhea dermatitis, skin bacteria, and fungi. This shampoo relieves itching,scaling and dry skin using all natural ingredients from soothing tea tree oil. The synergistic combination of vitamin E , wheat germ, rosemary and coconut oils, plus proteins and mild organic cleansers, provides rapid relief and deep skin penetration resulting in healthy, shiny coats. HYPOALLERGENIC: Contains no fragrances, dyes, soaps or other allergy-producing ingredients. Made especially for pets with persistently sensitive, dry and allergic skin, this extra mild, tearless shampoo is so gentle that it wont irritate while it cleans. Pure and emollient rich, it also helps to repair dry, brittle coats. TRICLOSAN DEODERIZING: Our fresh scented deodorizing shampoo contains Triclosan which helps attack he bacteria that causes “doggie odor”. Its deep cleansing, luxurious formula contains natural moisturizing agents that nourish the skin and coat. This special shampoo is especially effective in helping to eliminate the odor caused by skunk encounters. OATMEAL ALOE: Soothing and soap free formula made with 2% colloidal oatmeal. Designed especially to benefit sensitive, dry or irritated skin and is highly regarded for its superior moisturizing and anti-itch properties. The hypoallergenic and soap free formula is recommended for pets with allergies and seborrhea dermatitis. FLEA AND TICK: Kills fleas and ticks with natural, organic Pyrethrins. Special conditioners protect skin and hair from outdoor elements while providing manageability, luster, and sheen. You are currently browsing the archives for the About Our Salon category.